VHP tried to block Farooq's cavalcade to protest his remark that PoK belonged to Pakistan. 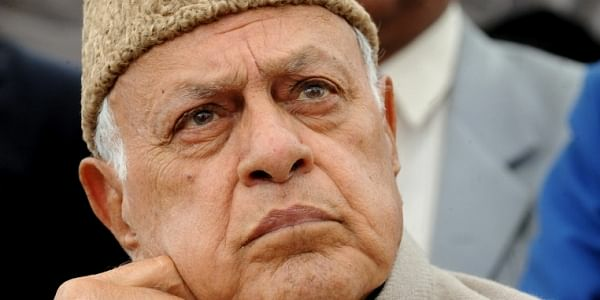 JAMMU: Protesting National Conference (NC) president Farooq Abdullah's remark that PoK belonged to Pakistan, VHP members today tried to block his cavalcade here, following which 12 of the outfit's activists were taken into preventive custody, police officials said. The prostesters from the Vishwa Hindu Parishad (VHP) and the Bajrang Dal tried to stop Abdullah's convoy at the Rehari Chowk when he was going to visit the house of a NC youth leader Tanvir Ahmad, they said. The police immediately swung into action and took over a dozen VHP activists into preventive custody, the officials said, adding that the protesters also raised slogans against the NC leader and his party, and showed black flags. "We staged the protest against Farooq Abdullah for his recent anti-national statements such as Pakistan-occupied Kashmir (PoK) belongs to Pakistan," VHP spokesperson Rajesh Kumar told PTI. On November 11, the NC president had claimed that PoK belonged to Pakistan and "this won't change" no matter how many wars India and Pakistan fight against each other. The former Jammu and Kashmir chief minister was accompanied by senior NC leaders including the party's provincial president for Jammu and legislator Devender Singh Rana. The protest had no impact on the programme, the officials said. PTI TAS ANB . This is unedited, unformatted feed from the Press Trust of India wire.